The CPU 162-17 packs the unparalleled performance and power efficiency of the latest Intel® Core™ i7 processors with the features of the Mobile Intel® QM77 Express chipset in a 125x95mm COM Express basic form factor. The CPU 162-17 has been designed to deliver superior performance and reliability, in particular for all those applications where uptime and availability are a must. Standard configurations support the Intel® Core™ i7-3615QE (2.3GHz, Quad Core) and i7-3517UE (1.7GHz, Dual Core) processors. The Intel® Core™ i7-3612QE (2.1GHz, Quad Core) and i7-3555LE (2.5GHz, Dual Core) configurations are build-to-order option. With support for up to 8GB soldered DDR3L-1600 ECC memory configurations, the CPU 162-17 is ideal to design systems that have to be very resilient to harsh operating conditions. The pinout of the CPU 162-17 can be switched from Type 6 to Type 2, allowing users to employ a single platform across a number of applications with the maximum efficiency. The CPU 162-17 supports most major operating systems, including Windows® 7, Windows® Embedded Standard 7 and Wind River Linux. More CPU Performance and More Graphics Performance – The CPU-162-17 equipped with the 3rd Generation Intel® Core™ i7 processors with the Mobile Intel® QM77 Express chipset delivering unparalleled computing power for high end application users. The combination of 22nm process technology and 3-D tri-gate transistor technology of the 3rd Generation Intel® Core™ processor achieves dramatic performance improvement of graphics / media processing and power consumption reduction at the same time. High Reliability for Critical Application – The CPU-162-17 has soldered -down processor and memory, ensuring critical operation; moreover, ECC support adds further reliability. 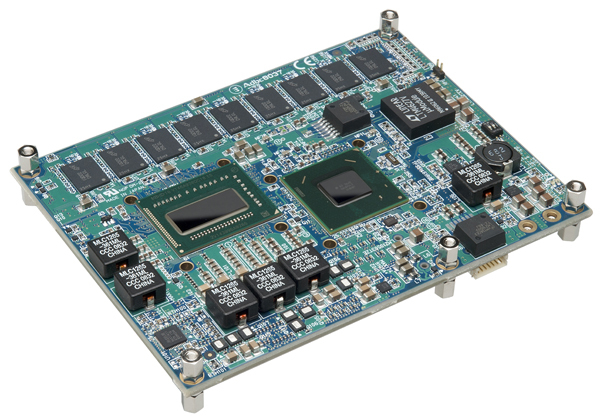 Powerful Graphics – The CPU-162-17 provides PCI Express Graphics, VGA and three DDI ports (DisplayPort / HDMI / DVI /SDVO) which are utilized by newly-defined PICMG COM Express Rev2.0, Type 6 pinout. Feature Rich, High Speed Interface – The CPU-162-17 delivers a broad range of peripherals, such as one x16 Gen3 PCI Express interface, total of six lanes of Gen2 PCI Express (configurable), 4 SATA ports (including 2 SATA-600 interfaces), two USB 3.0 and two USB 2.0 ports and one 10/100/1000 Ethernet interface.